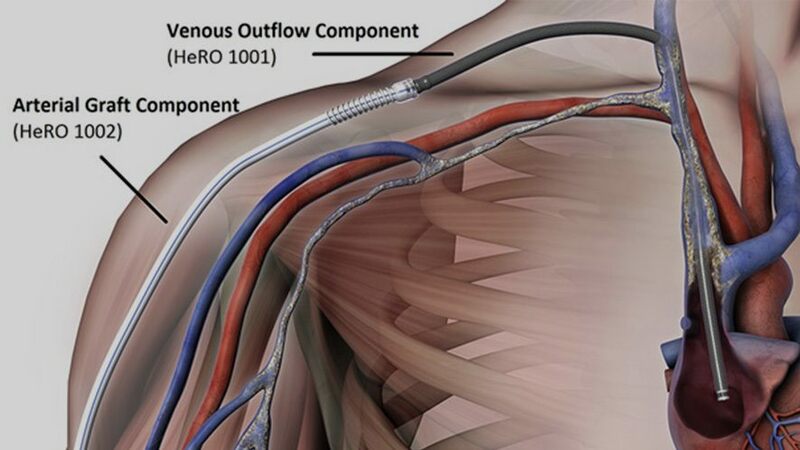 The HeRO Graft consists of the Venous Outflow Component* (HERO 1001). Additionally, in order to implant the HeRO Graft Venous Outflow Component, the Accessory Component Kit ‡ (HERO 1003) is required. ✝ The Adapter connects a 6mm ID ePTFE vascular graft ✦ (not included) and the Venous Outflow Component (not included). Only the ePTFE grafts in Table 2 below (not available from Merit) have been tested and are permitted for use with the Adapter. See HeRO Graft Adapter Instructions for Use (IFU) for full details. ‡ Accessory Component Kit is sold separately and provides instruments and accessories that may aid in the placement of the HeRO Graft. General Warning: The Adapter should NOT be connected to any graft other than a new graft listed in Table 2. **NOTE: The GORE ACUSEAL Vascular Graft is available through W.L. Gore & Associates. The FLIXENE Standard Wall Vascular Graft is available through Atrium Medical (Maquet Getinge Group). The HeRO Graft Arterial Graft Component has a 6mm inner diameter (ID), 7.4mm outer diameter (OD), and is 53cm long, inclusive of the connector. It consists of an ePTFE hemodialysis graft with PTFE beading to provide kink resistance near the proprietary titanium connector. The titanium connector attaches the Arterial Graft Component to the Venous Outflow Component and has a 6mm to 5mm (ID). The Arterial Graft Component is cannulated using standard technique according to KDOQI guidelines. The Accessory Component Kit provides instruments and accessories that may aid in the placement of the HeRO Graft Venous Outflow Component. W.L. Gore & Associates. GORE ACUSEAL Vascular Graft Configurations. http://www.goremedical.com/acusealvg/configurations/, downloaded on 08/29/2013. Atrium Medical Corp. Product Catalog, Vascular Grafts, Vascular Patches and Tunnelers, Dec. 2, 2011. Product FLIXENE Vascular Graft, Standard Wall. http://www.atriummed.com/EN/vascular/Documents/US%20Grafts%20Catalog.pdf, downloaded on 08/29/2013.